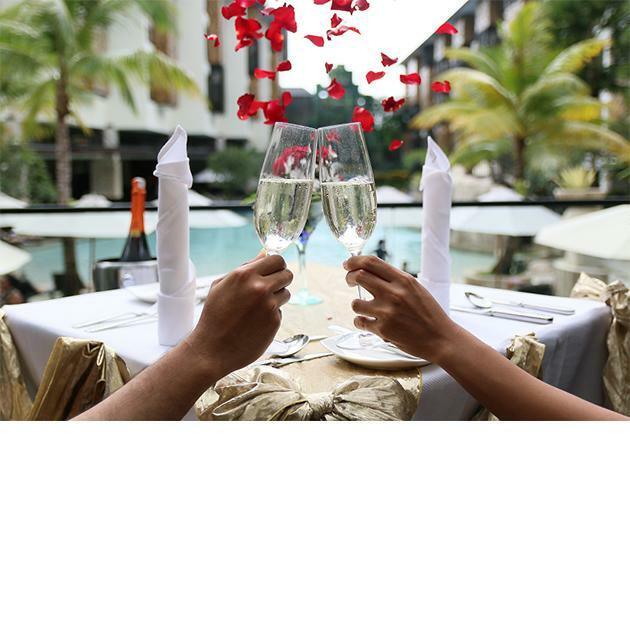 Are you planning to spend Valentine’s Day in Bali or to take your loved one out for a classy and romantic dinner with a five-star service in Seminyak area? The Trans Resort Bali knows how to put on a gorgeous dinner, complete with personalised service setting nicely in the heart of the resort with beautiful backdrop of white sandy beach pool and the 18-meter manmade waterfall. A classy 5-course set menu inspired by French and Italian specialties will be prepared only for this special occasion. Every single course will be made with love with fresh ingredients and cooked with curious imagination of the chefs to bring happiness and good memory in every bite. By it means, the artistry in preparing this Valentine’s menu comes not from taking a chop and throwing it on the fire, but from knowing how to make the nice Cured Foie Gras & Granny Smith Apple that will melt in your mouth and give the acidic balance on your taste buds, find the perfect flavor of Oxtail & Ceps Tortellini to create perfect texture of the very soft-very smooth Dolce Vita Dessert consist of Lemon Souffle, Cannoli Ricotta & Banana Tiramisu. Creating this menu requires real knowledge as well as the experience, and the culinary stars of The Trans Resort Bali has it all. It is not only about the food, the whole concept of the evening is about celebrating the journey of love between you and your lover. Romantic music playlist and beautiful fresh floral decorations will set the mood for the two of you. For this extravagant experience, you can book a table for two only at IDR 1,600,000++ includes 2 glasses of sparkling wine. If you are looking for more private and exclusive dinner experience, The Waterfall Garden is the perfect choice as you will have your own space with private butler serving a bottle of champagne for you and your partner, with the price of IDR 5,000,000++. Reserve your table today by contacting +623618981234 or email bali.offer@thetranshotel.com, and visit www.transresortbali.com for further information for early bird 20% discount offer.